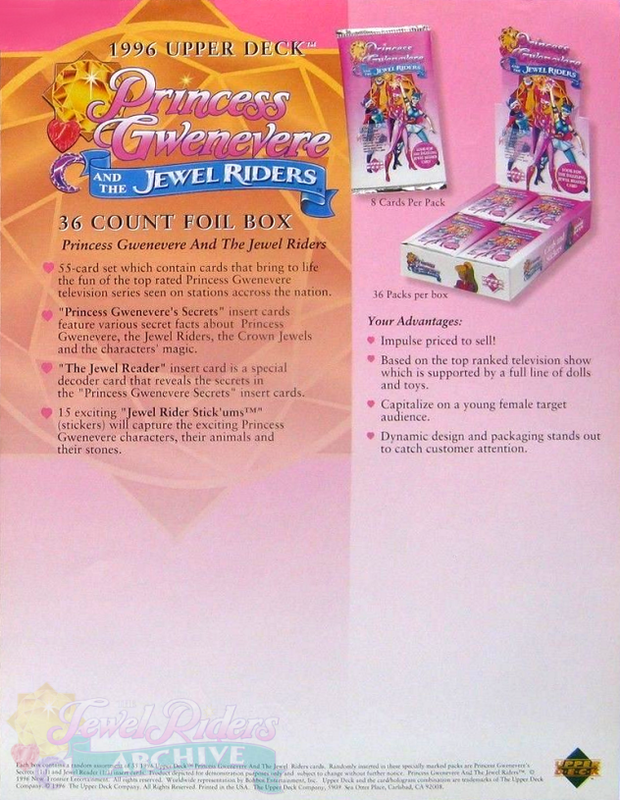 A variety of marketing materials were released to promote and bring attention to Princess Gwenevere and the Jewel Riders. One interesting piece is this sell sheet comparing Nielsen ratings of several girls-targeted 90s programs. 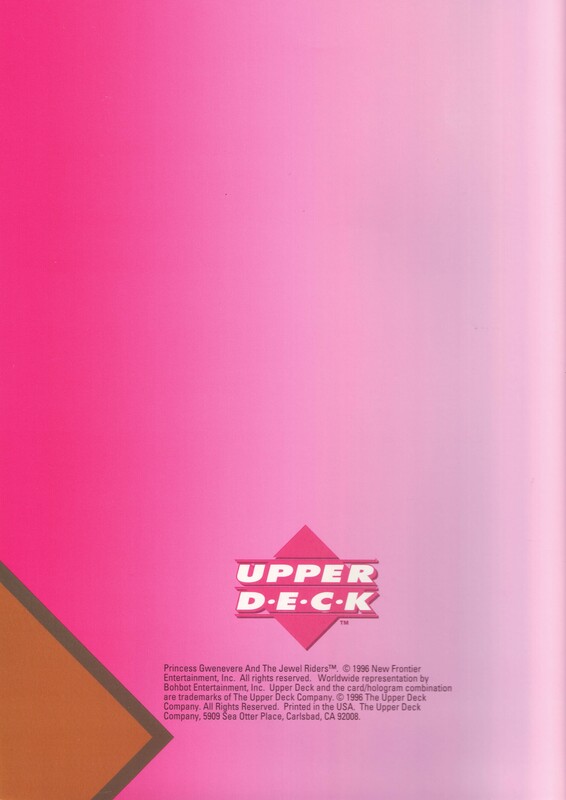 Upper Deck Cards also released several promotional posters to promote their collectible trading cards from the series. These included a folder that apparently could be used to display the boxes of cards in card and comic shops. 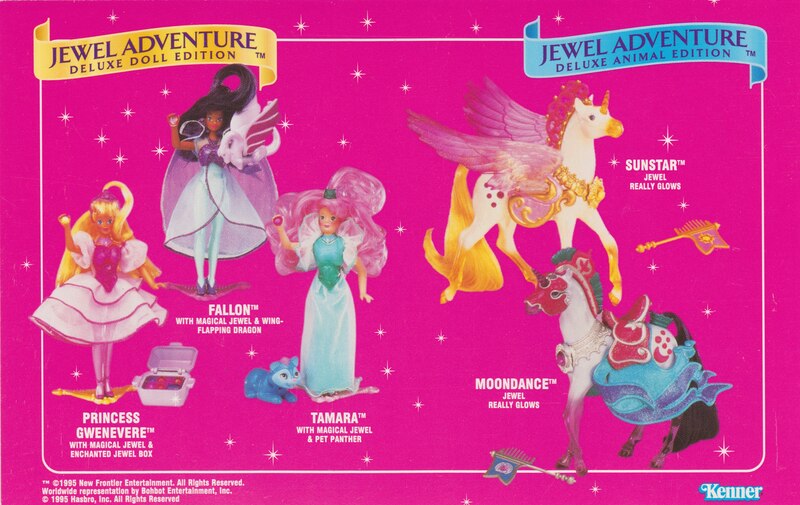 Hasbro/Kenner, makers of the toy line, had several lush pages in their 1996 Pre-Toy Fair trade show catalog. Did anyone ever own or see this jewelry in stores? Let us know! 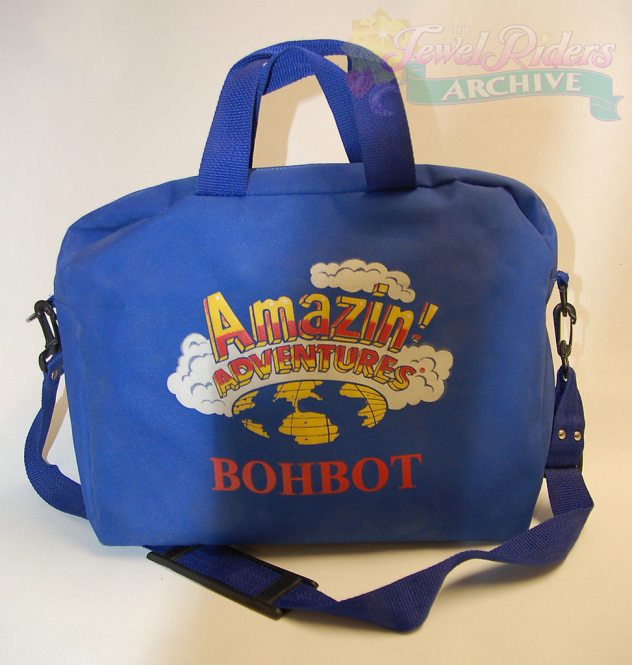 And finally, people who worked on the show were given this promotional messenger bag emblazoned with the logos for not only Jewel Riders, but the Bohbot and Amazin’ Adventures cartoon block logos as well! 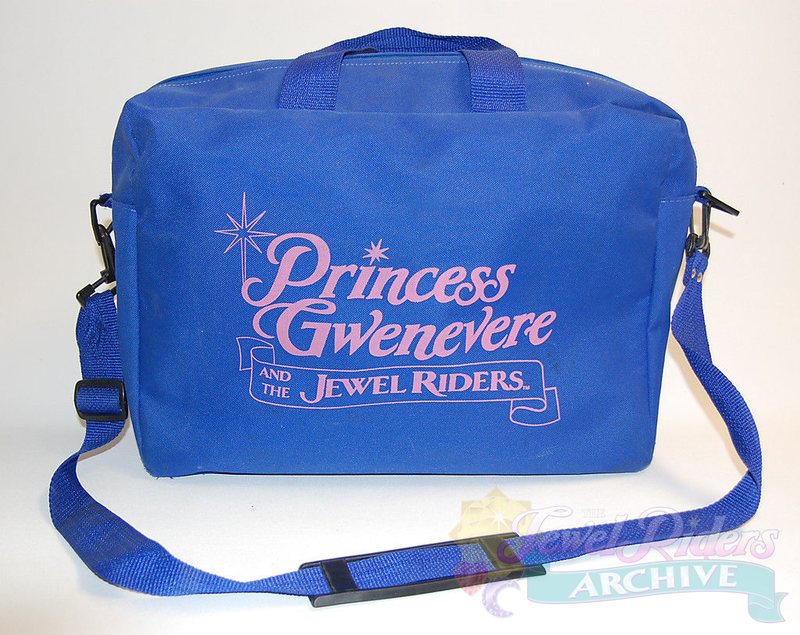 And of course, there were television advertisements. 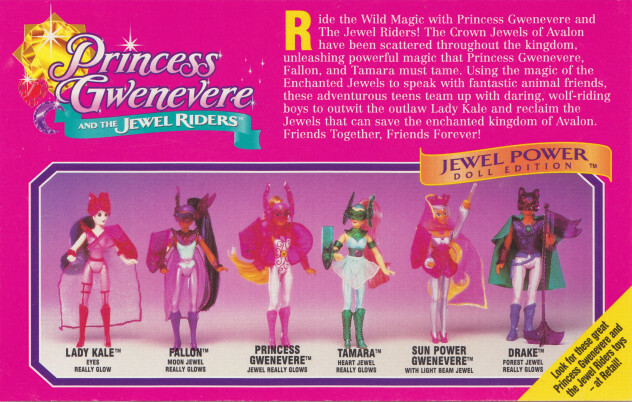 We have been able to find several for each variation of the show, including Princess Gwenevere and the Jewel Riders, Starla and The Jewel Riders, and Starla et les Joyaux Magiques. 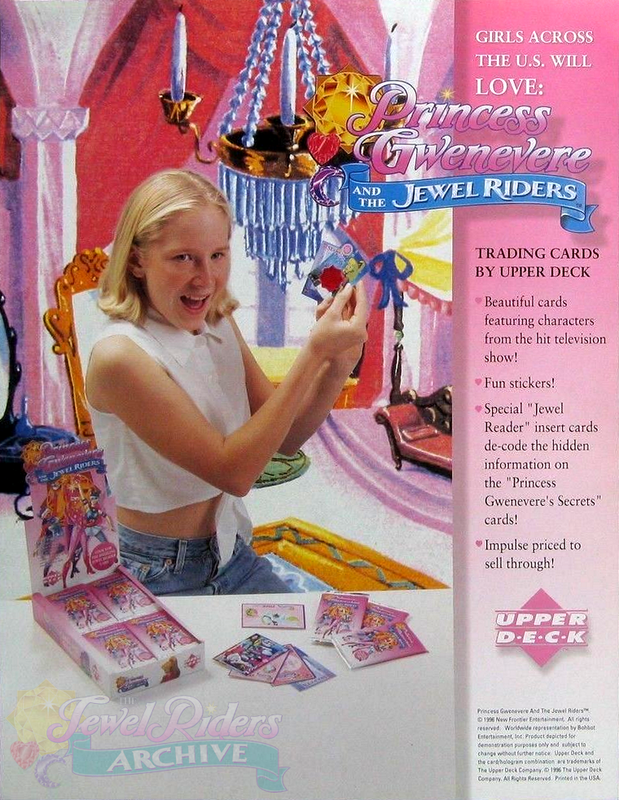 The toy advertisements are interesting to note for two reasons: first, the animation! 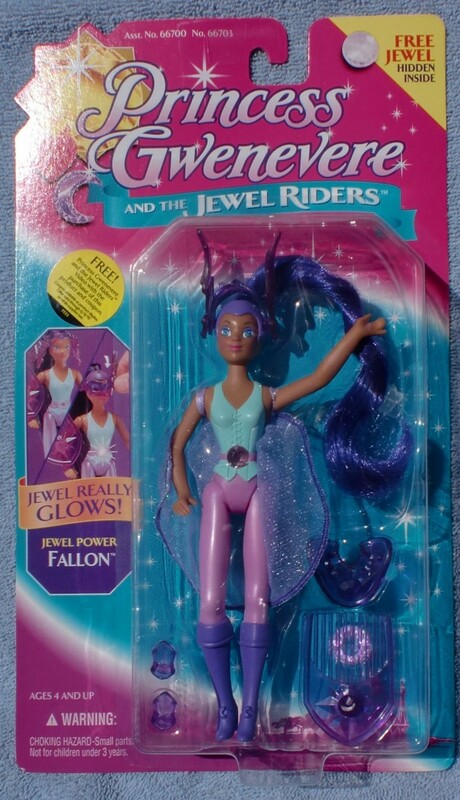 The characters are animated differently, more reflective of the toys than the cartoon. The other surprise was recognizing the voice of Laura Dean (Tamara) as the narrator for the toy commercials! We have many more advertisements available for viewing on our YouTube channel, so please check it out! 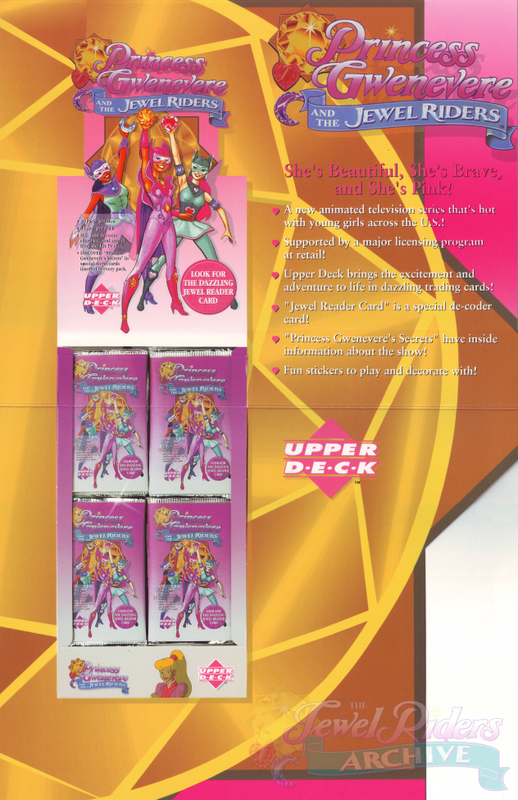 Finally, included with the VHS tapes were small cards inside the sleeve that advertised the doll line. 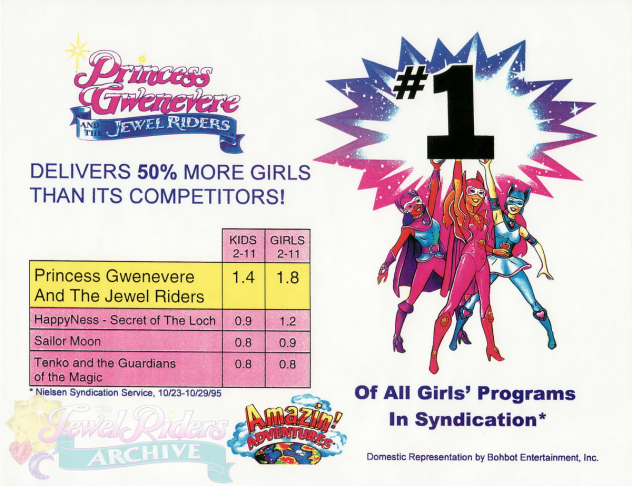 When consumers bought the toys, some included a sticker that offered a free promotional video that included the episode “Song of the Rainbow” with purchase and coupon for a limited time. 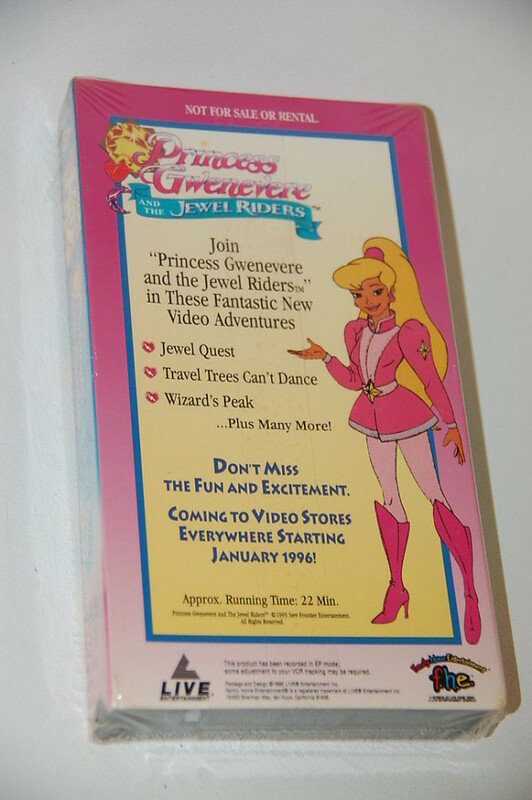 The later commercially released VHS tapes included a card advertising a special rebate offer. 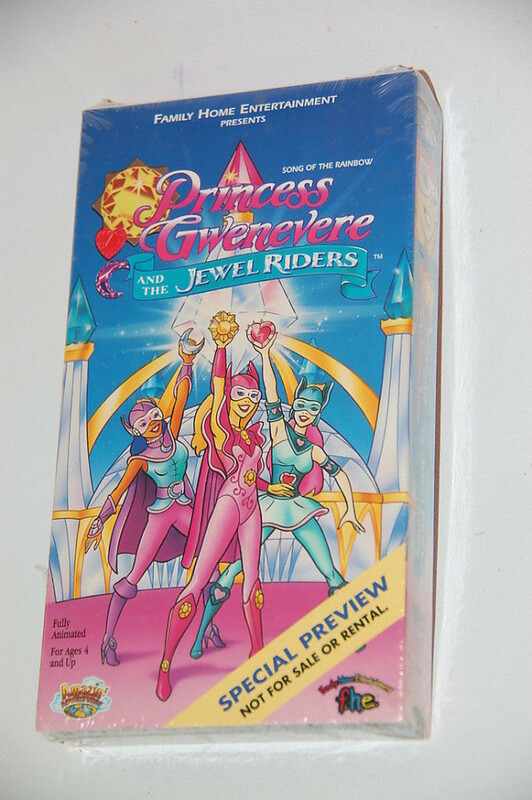 Family Home Entertainment, a division of LIVE Home Entertainment is releasing three volumes of New Frontier Entertainment’s Princess Gwenevere and the Jewel Riders on video. The volumes, each containing two episodes from the regular series, will be released on January 23. 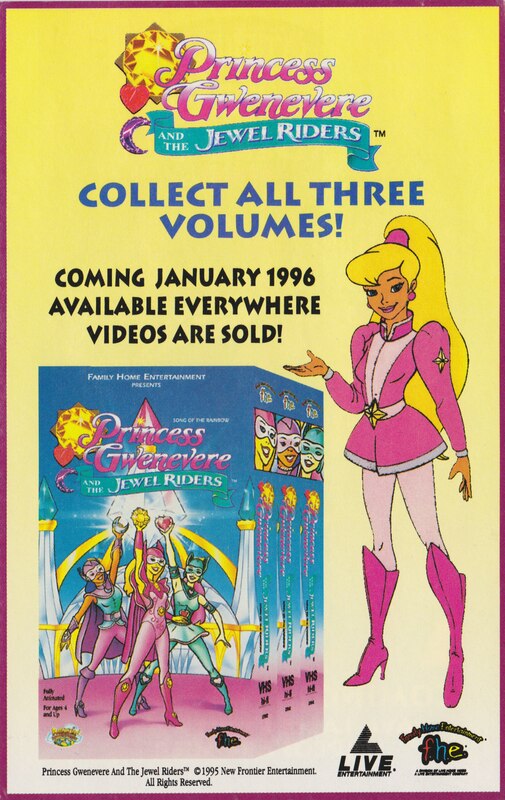 Leading up to the release date, Hasbro, in an exclusive agreement with participating Toys ‘R’ Us, offered an episode from the program on video for free with the purchase of a related toy through November and December 1995. A television advertising campaign, featuring a 30-second commercial for the toy ends with a five-second tag at the end for the video, is airing nationally on children’s cable networks with some spot buys. A cross-sell insert for the video will be included with eight of the boxed dolls in the Princess Gwenevere line and a cross-sell insert for the dolls and a $1 mail-in rebate is offered with all videos released in 1996. 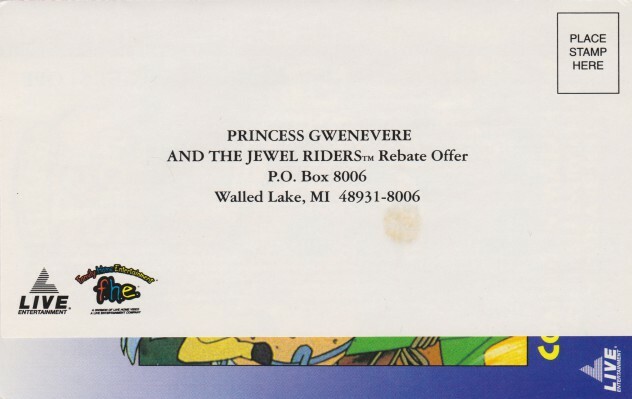 As well, a national ‘Watch and Win’ contest throughout February offers viewers the opportunity to win Princess Gwenevere videos and toys when kids mail in the correct code words from the show.